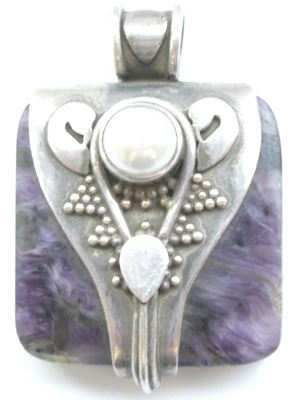 Large AMETHYST SODALITHE silver pendant - amethyst measures 3cm x 3cm (1.25ins) square cut and is 'wrapped' in silver which has been handcrafted in a beautiful and unusual design which has been further enhanced with a pearl. Sodalite (or sodalithe) is a stone to strengthen the power of mind over body. It is used to clear mental confusion - Eliminates fear and guilt. Cleanses the organs & boost the immune system.